An overdeveloped interest in history led me to wonder how Galileo really saw through his first telescopes. After reading accounts from the Galileo Museum in Italy, and the SciTech replica builds, it was determined that the maestro would have fallen in love with Ace Haedware, Surplus Shed and modern glues. I had no wish to shape or glue wood strips for the tube, nor grind lenses, nor mess up an expensive piece of leather, only to make a reasonable facsimile of his telescope #2428, with close to original focal length and powers. And to do so with as little fuss, and available materials. Galileo's original objective had a 37mm diameter, with approx 980mm fl. An Edmund-47mm lens would provide a 20x view. The main tube , 1.25" od aluminum, was cut from an old pool skimmer. 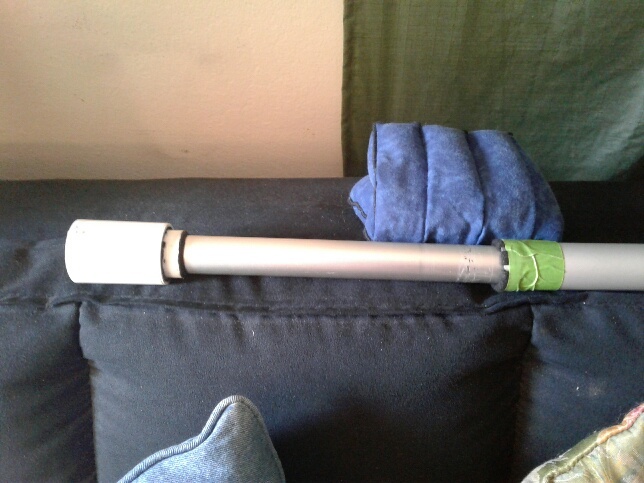 Inner sliding focuser tube I found from an old umbrella pole. The inside diameter of 25mm was more than enough to accommodate the original objective stop down to 15mm. My concession to the eyepiece end was to fit it to receive 1.25" eyepieces, to try more modern ones. 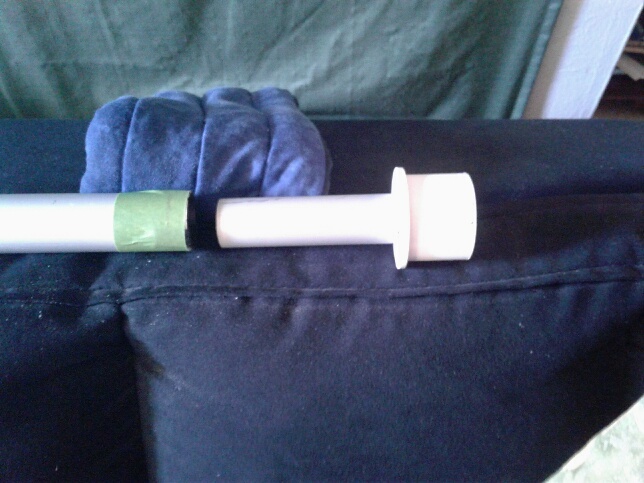 20 minutes at the PVC plumbing section at the hardware provided cells and bits for both ends of the scope. Assembly of the "skeleton" is pretty much done, tho more flocking needed in inner tubes. A fun easy and inexpensive project. The most expensive part so far was the Sugru glue, well worth every penny for ease of use and moldability! It's funny that you should mention that. Today I found myself playing with a very old spyglass (four-draw, pirate style, approximately 12x25) that I have purchased so many years ago that details of its acquirement has faded into obscurity. Its images are, or should I say were, not very good, but upon playing with it, I discovered that the objective has been assembled incorrectly for who knows how many decades and that after remedying it, it gave surprisingly usable images. So, there I was, playing with a tiny spyglass, whilst a perfectly fine 102mm apochromat stood idle mere feet away. The contrast between their respective views could hardly have been starker, but the spyglass nevertheless left perhaps the more memorable impression, as it made me think of the enormous progress we've seen in equipment available for common amateurs this century. A hundred years ago, a man of my class, a worker, a farmer, would scarcely have been able to purchase anything more expensive than the tiny spyglass, smaller than even the finder on my 102mm apochromat. We've come a long way, as your copy of Galileio's scope will no doubt also show you. Do also try to build some keplerian eyepieces, so you can see the difference between the two designs. Keplerians are also much more pleasant to look through than Galileian ones. They perform extremely well with long focal ratio objectives and I think you'll be quite stunned by how much you can see. Thank you, Thomas! Most amazing was Galileo's use of what he had, his grand curiosity, and systematic approach. If I'm stuck with the smallest apertures, I could only hope to see and understand as well. 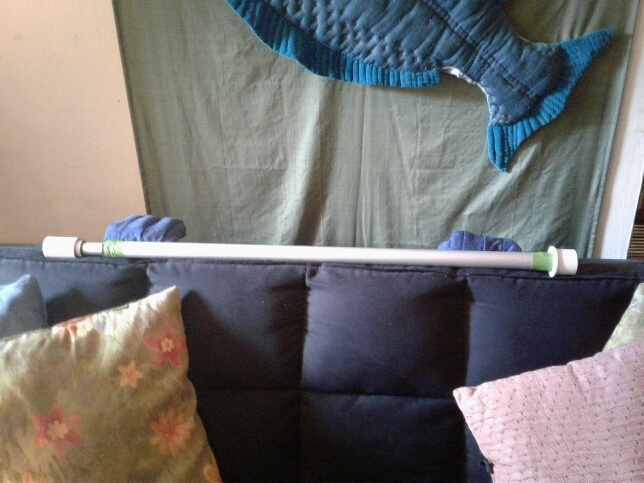 Here's the detachable objective cell. Measurements are as close to original as possible. The focuser end. Both slide in on felt bushings. Galileo's original, #2428 , a beautiful goal..
And no one is going to tell me that Galileo's actual first telescope was as nice looking as the museum sample. Something tells me that he was a very practical guy, when it came to it, so his first one was probably something not unsimilar to yours (except for the green tape and use of plastic!) and the surviving museum samples are later ones that he built with more care and attention, as he mastered the art and wanted something nice to show visitors and prominent guests. I wouldn't doubt he made fancy ones for his patrons and to sell to fund his projects. 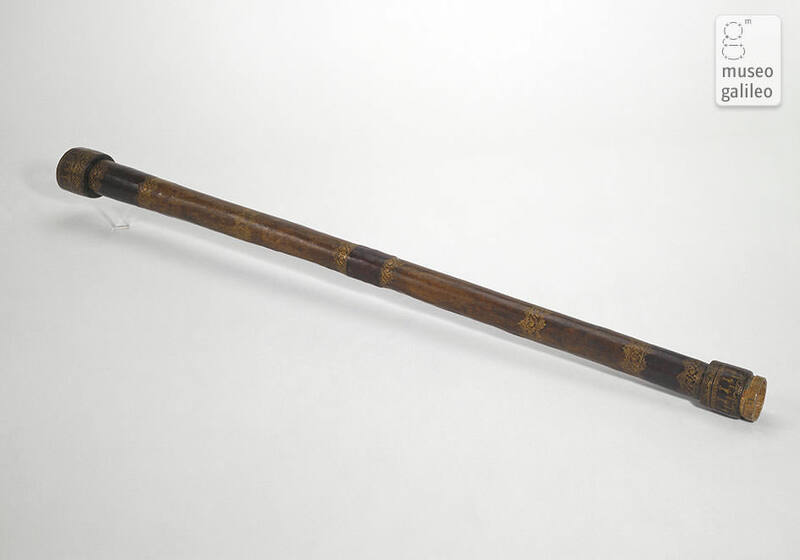 In the Museo Galileo site, the longer 2427 scope looks like his workhorse, wooden tube held with copper wire and covered in brown paper, with wooden ends. I've wanted to make the same, we can see the same sky within a degree or two. Please do, Robert! The SS lenses make it within anyone's reach. Maybe going through the AL Galileo club program to reproduce his observations would be an idea. I'm itching to put the glass in this, to try out, but weather says no, and must pace my atm work a bit. I probably mention too much my reflections upon the comparative view through Galileo's instruments versus the humble achromats available today. It just seems like the most useful perspective. I'll bet Galileo would have loved to have star diagonal or an inexpensive EQ-2 mount. I got to observe a nicely placed Jupiter through an accurate replica of the spyglass that Galileo used to make his discoveries while at a conference in Middelburg in the Netherlands. It was held to commemorate the 400th anniversary of the "invention" of the telescope in 1608. Even using the window ledge to support one end, at 20 or 30X (I forget which he used) it was extraordinarily difficult to even FIND the planet, as the field of view was so narrow that it was like looking through a straw, and of course it was moving, too. I was even more impressed by Galileo's feat!! To get the true effect try to replicate that as well. It demonstrated just how important supporting the tube was, something not as well documented. What seems to have been used was two long-enough boards joined at 90 degrees to support it along its length. It should pivot up and down as well as move side to side, altaz only, as equatorial mountings came more than a century later. It also explains why many of the surviving 17th century telescopes had a ring (disc) at each section that was the same diameter. That made sag less of an issue and kept things aligned. as equatorial mountings came more than a century later. Wrong. Christopher Scheiner had an equatorially mounted refractor with an attached projection screen for plotting sunspots. Of course, I've seen that very engraving before, and it was redrawn for King's "The History of the Telescope". That'll teach me to not check my sources. I still believe that there's no contemporary evidence of Galileo using an equatorially mounted instrument. My main point is that the tiny field of view made his successful observations all the more impressive. Almost 400 years later I at least knew what I should see, and I had a really hard time seeing it for long enough to confirm the orientation of the moons. Some of the others present couldn't even get Jupiter to be anything other than a white streak occasionally passing by. The Surplus Shed 38mm lens is listed as double concave. The focal length is MINUS 1000mm. Not suitable as an objective since it is a diverging lens. Galileo never used an equatorial mount, though they existed in his time or indeed even before the invention of the telescope. The celestial coordinate system is older than the telescope and Tycho Brahe had an equatorial armillary sphere. Edited by terraclarke, 18 February 2019 - 12:51 PM. Indeed. Here it would be more prudent to follow in the footsteps of Scheiner and use the projection method. I made a Galilean reproduction when I was a kid, I was amazed that he made the observations he did. It made the worst Towa seem like the greatest optics ever made. True that! I reckon the $3 worth of "educational" lenses from SS are better glass than he ever could have hoped for. I'm trying to find more info on G's "helioscope". Was he looking throu smoked glass, or projecting an image to find sunspots? But he just couldn't be like everyone else. "No you ignoramuses, there is my better way! Behold...AHHHHH!!!" True that! I reckon the $3 worth of "educational" lenses from SS are better glass than he could have looked for. Actually better....remember he hand ground his …..no doubt not nearly so well as yours. So yours should be clearer, sharper, and brighter. I seem to recall having read somewhere, that when actually tested, Galileo's telescopes actually weren't half bad and the views were surprisingly good. His drawings also show that his scopes must have been decently sharp. How is the "Galilean Renaissance" scope coming along? Will the tube be decorated like Galileo's?